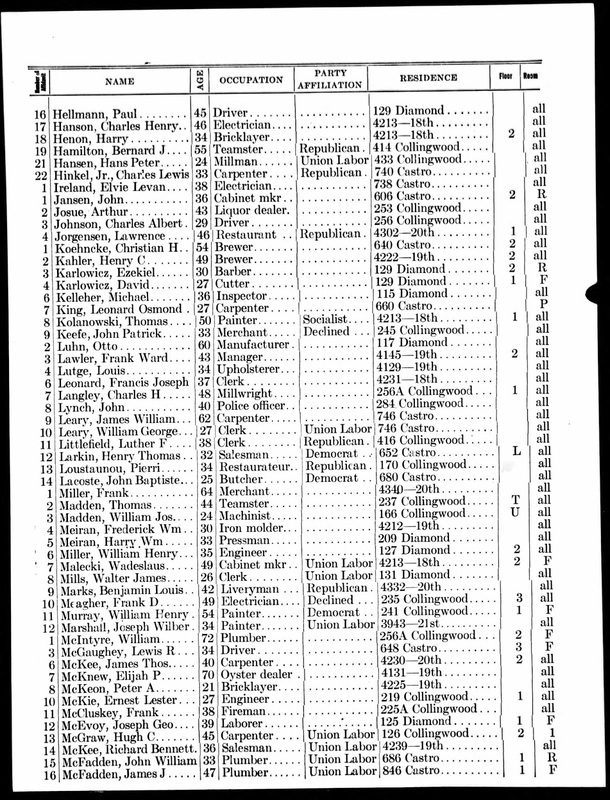 Genea-Musings: Treasure Chest Tuesday - 1908 Voter Registration for Elijah McKnew in San Francisco, Calif.
Treasure Chest Tuesday - 1908 Voter Registration for Elijah McKnew in San Francisco, Calif.
* Name: McKnew, Elijah P.
"California Voter Registers, 1900-1968," digital images, Ancestry.com (http://www.ancestry.com : accessed 12 February 2018), San Francisco County > 1908, Roll 007, no page number (image 1022 of 1539), Affidavit No. 3, Elijah P. McKnew entry. 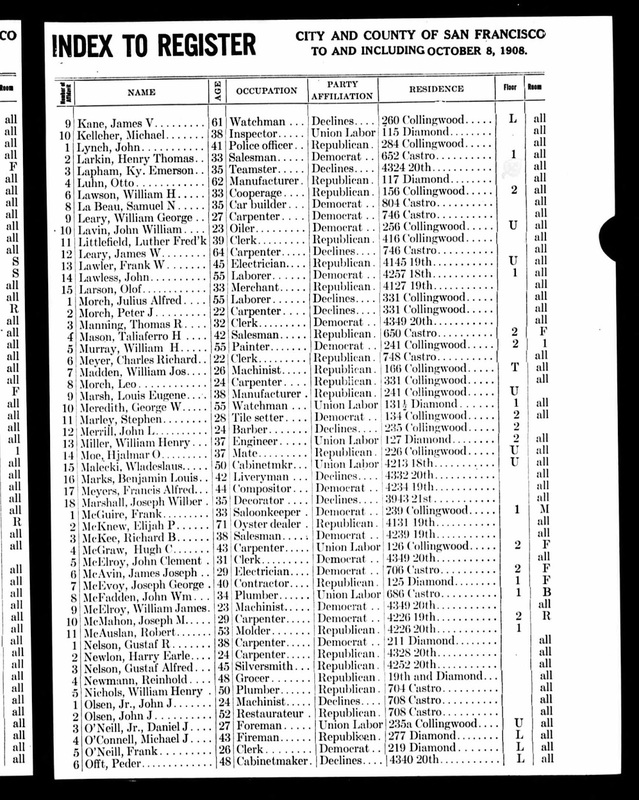 This is the eightth Voter Registration entry (1876, 1880, 1882, 1886, 1892, 1898, 1907 and 1908) for Elijah McKnew in San Francisco. 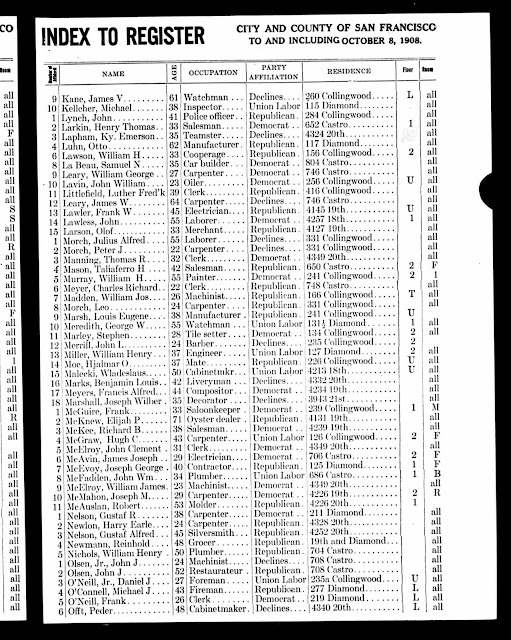 In the 1908 registration , he was age 71, worked as an oyster dealer, and resided at "4131 19th," and was a Republican. In this record, his name is not exactly right - it should be Elijah Pickrell McKnew, but the middle name changed almost every registration. Elijah McKnew (1836-1912) married Jane Whittle (1847-1921) in 1865 in Tuolumne County, California, and they had 11 children between 1867 and 1892. Elijah and Jane (Whittle) McKnew are my wife's great-grandparents.